This is the first time I have watched it the full way through since I was there that day. Stokes was unbelievable that afternoon. Absolutely unplayable at times. He could have taken 5 goals off Rangers. Terrific stuff. Also - that Gray winner. I can still close my eyes and picture it going in from where I was standing. What a moment. However bad things get, nobody can take that day away from us. Yes, we’re struggling at the moment but it would have been some seriously shan times if we’d been beaten that day. I honestly think if stokes effort had gone in instead of crashed off the post we'd have won 4 or 5 nil - and he'd have had a hat trick. The performance from Stokes that day was the best individual performance by any Hibs player in any match in my lifetime (30 years). He tore their defence to shreds that day and could easily have scored 2 or 3 more. Stokes' part in that final will be spoken about for years to come. I’ll go as far to say as that’s the best individual performance we will ever witness watching Hibs. Just absolutely incredible stuff. He was like a man possessed and walked on to the pitch with the mindset of “I’m not letting us lose today”. He will forever be one of the biggest legends in our clubs history. Pretty much straight from our kick off. Tbf, if we'd taken one of the chances we had before they equalised it might have been a rout. One time when I was watching the match I tried counting the number of attempts Stokes had and I think it was about twelve, which was pretty much the same as the entire Sevco team. Regardless of how often I watch it, I still can't believe that one doesn't go in. No way rangers created 12 chances! I don't think Logan made a single save the entire game actually. Stokes was simply incredible that day. Delighted to see the appreciation for Stokes on here. Many hibbies had been waiting a lifetime for someone to stand up and be counted when it mattered most. He (amongst others) did that, and irrespective of what happens throughout the rest of his career and life we mustn't ever forget that. You can’t downplay the part Hendo played either. Where Stokes was fired up and created a ton of chances to change the game, Hendo was cool as a cucumber and made the most of the two that presented themselves. Two corners, two perfect deliveries, two goals. Awesome. I didn't really know what "unplayable" ment until that final. Rangers had absolutely no idea how to cope with him. He could have had 5 or 6 that day. Incredible performance. We had a few 10/10 performances that day. Stokes, Hendo, SDG, McGinn. McGregor was an 8 for the first goal, Cummings had an off day but his assist for the first was a nice pass and Logan didn’t have much to do. Keatings was an effective sub and after he kept getting pesters and comments of “no team has been successful with a diamond” Stubbs quick thinkin* to change formation, take off Cummings and Fonts and go with the formation we were used to despite the drop in form Stubbs got the decisions bang on the button that day. We could have played Man City that day and won. Was absolutely inspirational from him! Couldn’t have said it better myself. He was unplayable that day and given his critics he stepped up to the occasion like nobody else has in my time of watching Hibs to play the most significant part in our greatest moment. Nope. I'm as calm watching it now as I was at the time. On the other hand, it took several seconds before the equaliser sunk in. My heart and spirit both still fall when Halliday makes it 2-1!! I did think on the day , that that was that and we had blown it again. Didnt work out that way , though , did it!! I think Halliday’s goal, and his reaction to it, makes the win even more special. In some ways winning it the way we did was more special for me than had it been 4-0 or 5-0. My favourite period in the whole match is after Stokes’ equaliser. It feels like we are marching towards the hand of fate with only one possible outcome. I’ve never experienced ten minutes of football that can remotely resemble that period and I doubt I ever will again. I love it!! I always cheer and give it the "Halliday has surely won the cup for Sevco!!" commentary!! Last edited by we are hibs; 08-12-2018 at 07:09 PM. 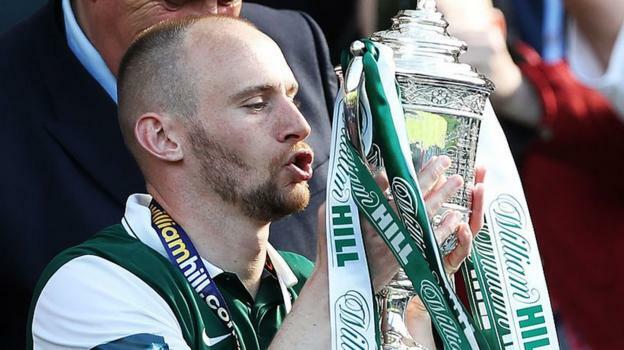 Tell you what, on the Sky coverage at the start when Stubbs talks about his battle with cancer and the other Hibs fans he's spoken to who were battling it, when he says "if we win then my medal is getting donated" is the single most Hibs class moment I can ever remember. An absolute gentleman who has been treated terribly since leaving Hibs. He chased back & put in an incredible tackle to win us a throw. The rest, as they say, is history.